Giovanca and Dany are a great Gibraltar-based couple and as many mixed couples today, they were fusing their mixed Spanish, Gibraltarian and Moroccan backgrounds together in their own special way to celebrate their wedding in Spain. 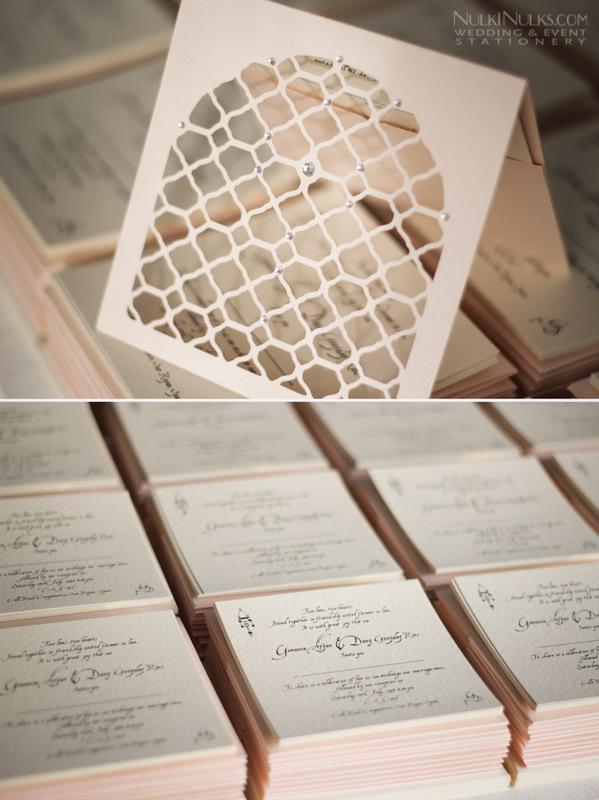 It was really a great pleasure to meet and work with them on their stationery. Although Morocco was to have a large influence on the styling throughout, Giovanca also wanted a soft elegant feel. This was achieved with her chosen colour palette of soft coral, ivory and silver versus the usual strong hues normally associated with Morocco . 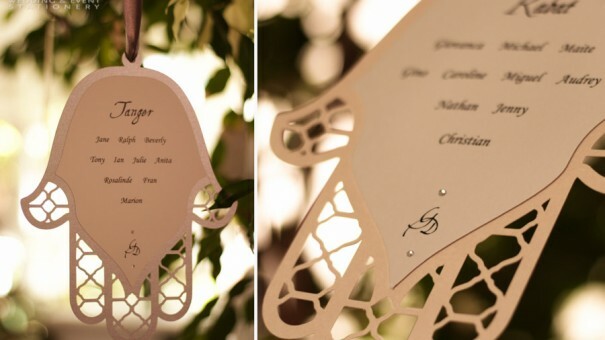 The soft coral took pride of place with the invitation pocket detailed with clear diamante. Ivory textured internal wording cards and printed in both English and Spanish Language consisted of Wedding Invitation Card, RSVP Card and a printed RSVP envelope. I do enjoy when couples add their own spin to their invitations, Giovanca & Dany wanted their guests to respond to their wedding invitation along with the recipe of their favourite meal. I thought this was a lovely touch and a great addition for any keen cooks and foodies out there! We continued with the same colour palette for the ‘Day of’ stationery and introduced the silver along with the soft coral, ivory and diamante details from the invitations. 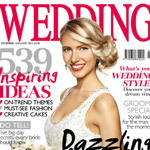 Giovanca was a hugely organised bride, the best to date, I think! This was great for me as she was able to share a lot of her plans for their day quite early, which in turn gave me time to play with ideas and suggestions of how we could complement them. 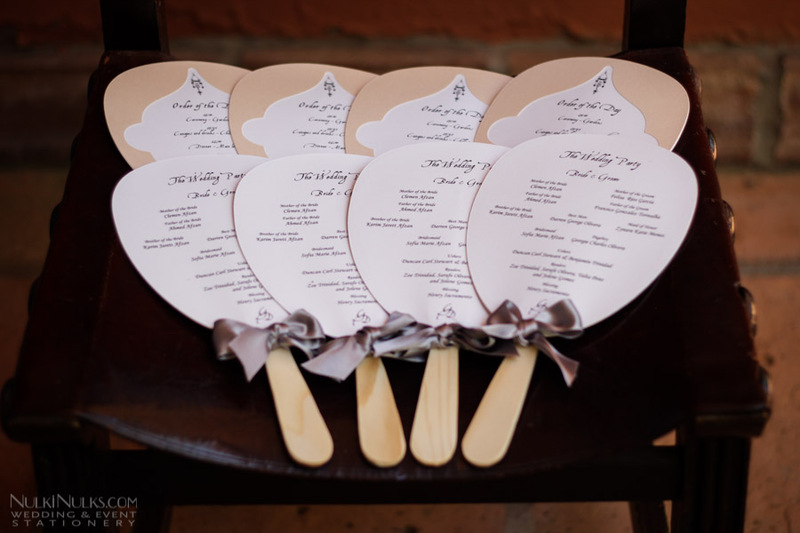 The ‘Day Off’ stationery consisted of double sided Paddle Fans with ‘Order of the Day’ and ‘Wedding Party’ list to keep guests cool in the sun. 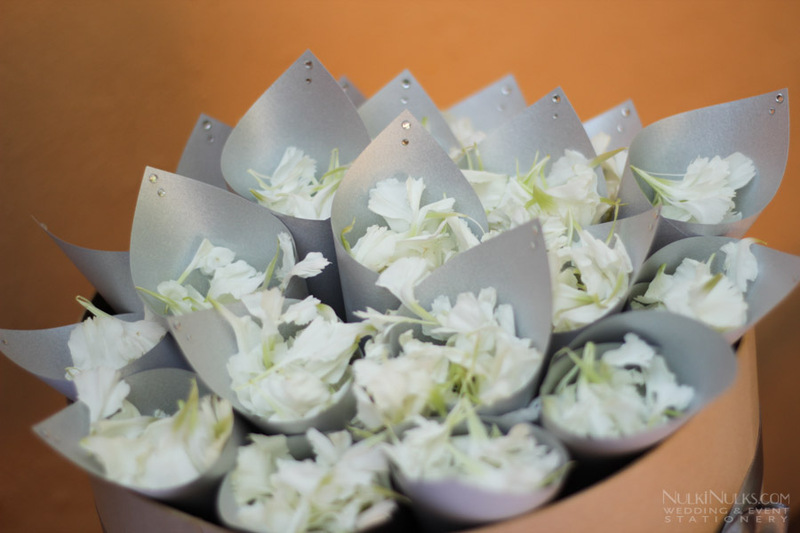 Silver Confetti Cones with subtle diamante detail were filled with ivory petals. 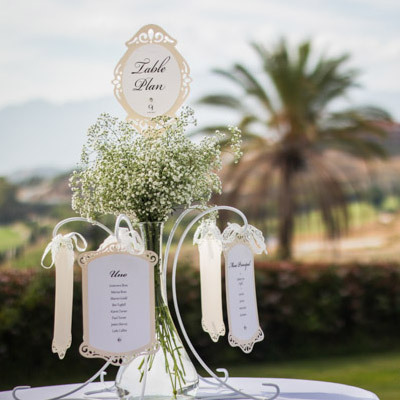 A Hanging Table Seating Chart took centre stage in the middle of the cocktail area. 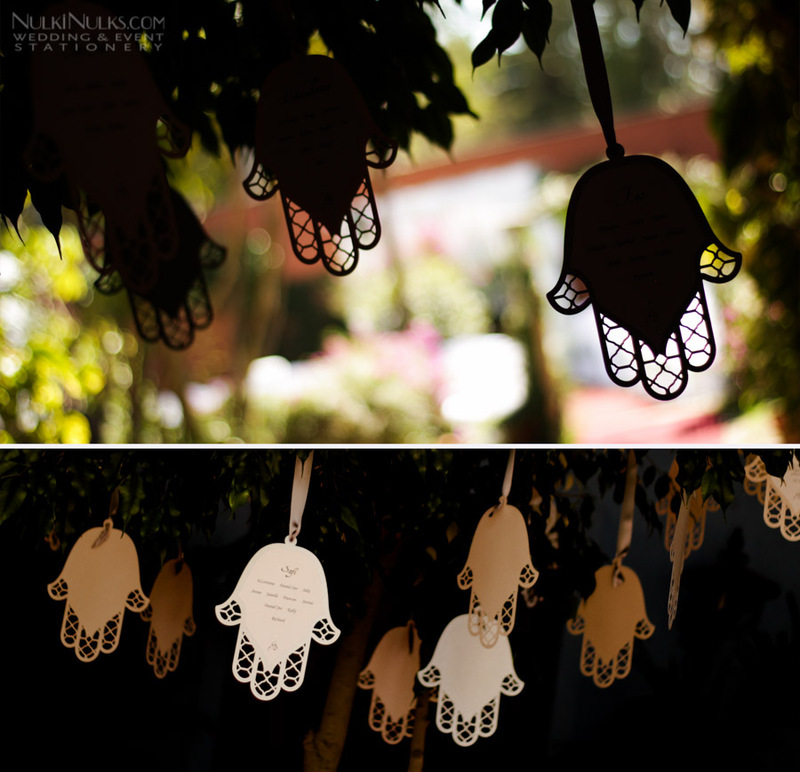 This was were we took the opportunity to introduce the Hand of Fatima in a mix of silver and coral cardstock suspended from silver satin ribbon. 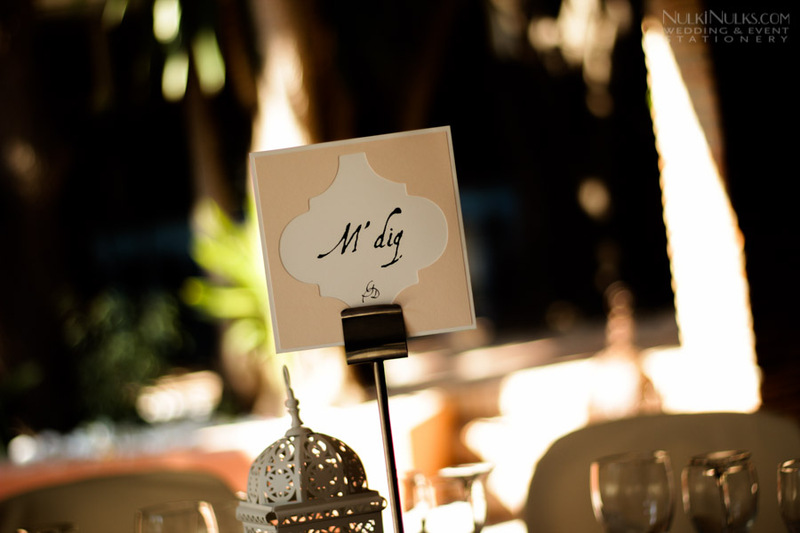 We rounded up our contributions with Table Names, Favor Tags along with Dessert Table Signage. 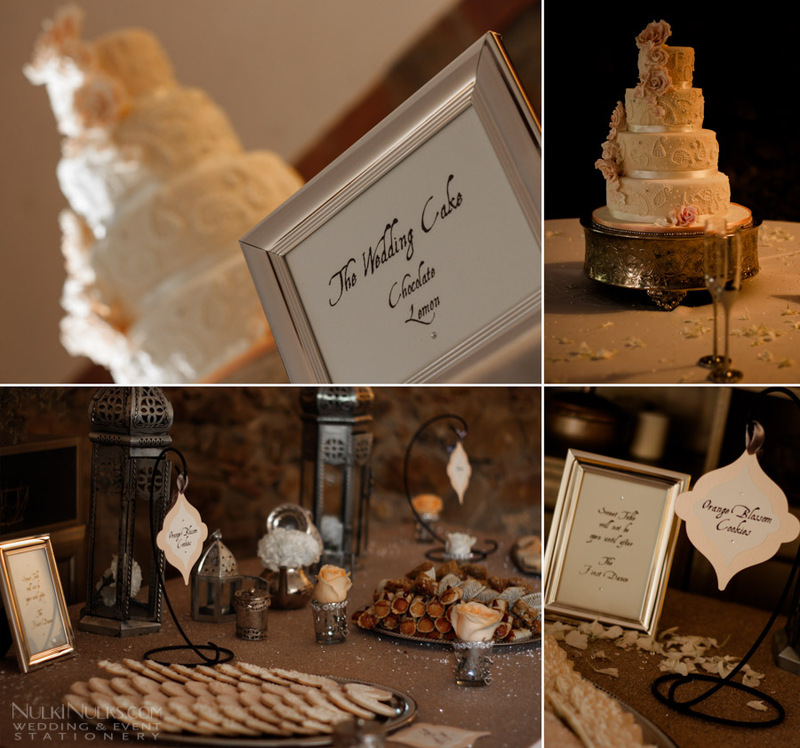 Another great cake and dessert table from Sweet Things by Fi! The best part of my year’s journey with Giovanca and Dany was the huge honour of being invited to their Big Day!! I got to see them tie the knot for myself, amazing!! Dany looked very dapper indeed, but Giovanca WOW a picture of beauty and elegance! A beautiful couple inside and out, congratulations to you both all over again and again and again….. The honour was all ours. We have been so lucky to have found such a talented angel who blessed us with her imagination and ideas. You made our vision a reality. And to be totally honest you exceeded our expertations with your work and professionalism. 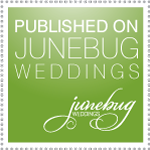 We are ever so grateful for everything you have done for us and making our journey towards our special day go so smoothly and perfect.